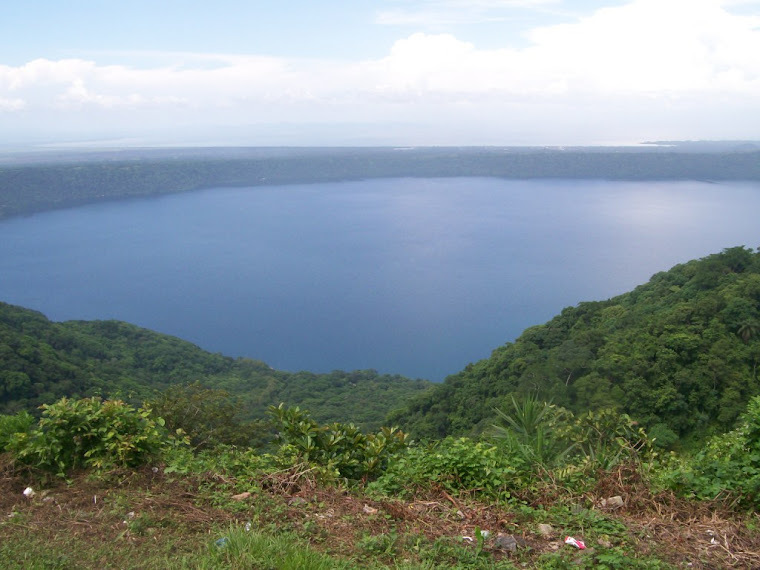 Laguna de Apoyo Nature Reserve is known for its deep, blue lake, whether from near or far. The forest around the lake, however, holds a reservoir of life in great diversity. Animals large and small climb its trees and hide under its rocks. Some wildlife fly, others crawl, and many hide while in plain view. Here are a few images of the wonders we have encountered recently. Order Phasmatodea in Laguna de Apoyo Nature Reserve. Photo Laura Ruysseveldt. 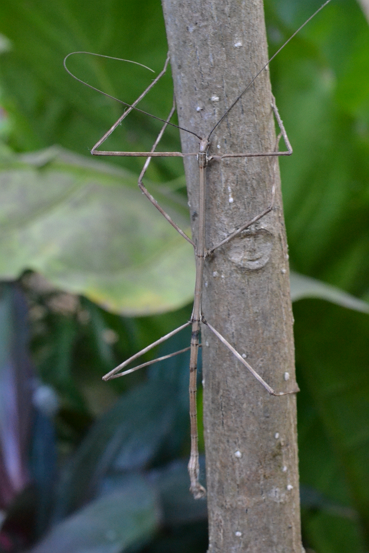 The walking sticks (Order Phasmatodea) are insects, widely distributed in warm climates. Over 3000 species are found in this group. Generally, the females have broader abdomens than the females. They have additional defenses against being detected, by swaying as if a twig in the wind, and falling to the forest floor if molested. Some walking sticks may flash bright colors when they detect danger, and some even emit foul-smelling substances when attacked. The walking sticks are easily overlooked, as their natural disguise is quite successful. Praying mantis (Order Mantodea) in Laguna de Apoyo Nature Reserve. Photo Laura Ruysseveldt. The praying mantis (Order Mantodea) is also an immensely diverse group of species. 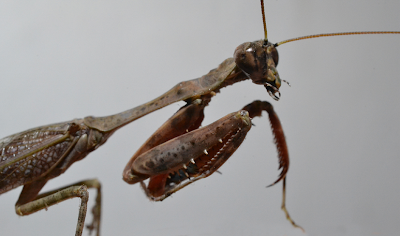 There are more than 2400 species of praying mantis throughout the earth. Which is this one? Who knows! Scorpion in Laguna de Apoyo Nature Reserve, Nicaragua. Photo Laura Ruysseveldt. Scorpions are much feared, in some places even deadly. Thankfully, we have no deadly scorpions in Nicaragua, but that consolation only reduces the pain of a sting to annoyance. 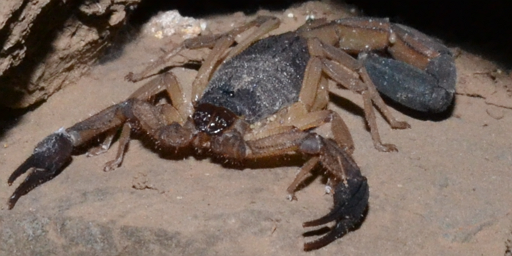 In the forests of Laguna de Apoyo, the scorpions can be abundant. The Order Scorpiones contains more than 1500 species, but only about 25 of them are deadly. They are not insects, but closer relatives to the spiders. Their colors are usually neutral to the human eye, but they remain undetected often because they stay still long periods in crevices. The scorpions can last long periods without food or water. Nicaraguan Satyr, Cissia themis, in Laguna de Apoyo Nature Reserve, Nicaragua. Photo Max Schellekens. 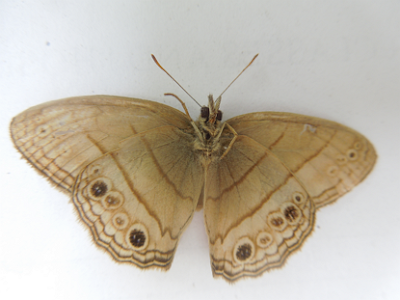 Our research group at FUNDECI/GAIA has been studying the butterflies of Laguna de Apoyo Nature Reserve for a few years already. Among the species which spend extensive time on the forest floor among leaf litter, the undersides of the wings are usually more brightly colored and patterned than the uppersides. 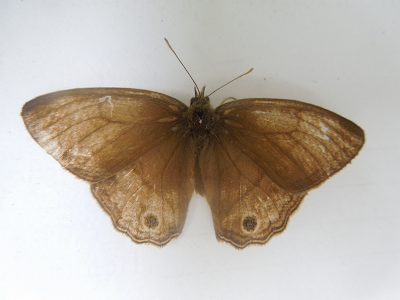 The underside of the Nicaraguan Satyr, Cissia themis, demonstrate this tendency. The ventral wing pattern, seen above, is delicate and more complex, especially along the posterior edge of the hindwing. The dorsal wing patter, seen below, is contrastingly dull and simple. Dorsal view, Nicaraguan Satyr (Cissia themis) in Laguna de Apoyo Nature Reserve, Nicaragua. Photo Max Schellekens.